This is the granola lovers dream right here. Coconut + Cashews + Vanilla = Pure Bliss. The only thing missing in this granola recipe is chocolate but if you’re that desperate for a hit you can throw a few chocolate chips in AFTER you bake it. 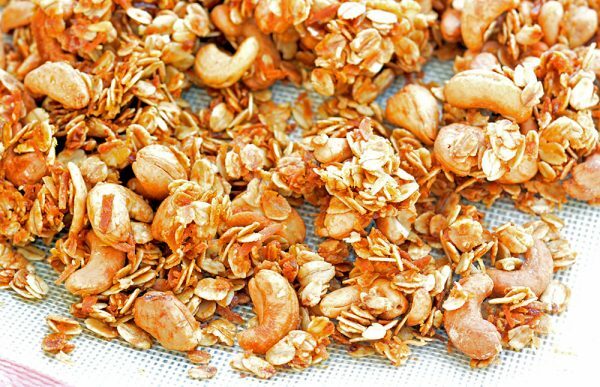 This Coconut Cashew Granola recipe is perfect as is, however. We here at FoodieandWine.com like to grub it down in one sitting. No need to put it on your greek yogurt or toss it over fruit. It’s good on it’s own which can’t be said of all granola recipes. We like chunky, hearty and textured granola. There’s nothing worse than granola that tastes as though it came through a McDonalds drive thru menu. $1 menu or not, just say no. Feel free to add a bit more of this and a bit less of that. If you like less oats and more nuts….go for it. Confession…when we take the cookie sheet out at the halfway point we “may” drizzle a bit more honey on the beast. Of course if nobody saw us do it, it didn’t happen. Rules of the kitchen playground. Our favorite Shredded Coconut is by Bob’s Red Mill. It’s nicely priced on Amazon. This granola recipe will go well with our Chia Seed Pudding recipe. Preheat the oven to 300 degrees and line 2 baking sheets with a silicone baking sheet or parchment paper. 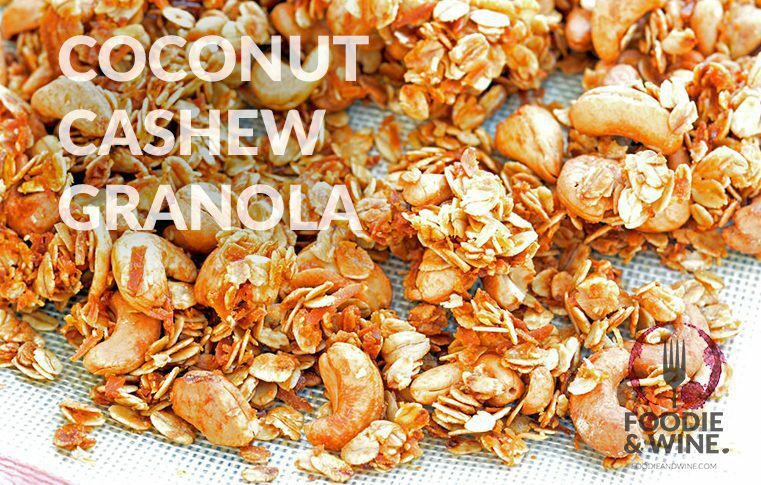 Add the oatmeal, shredded coconut and cashews to a large mixing bowl and combine. Set aside. Add the honey, coconut oil and vanilla extract to a small bowl and combine. Pour the wet mixture over the granola and stir until the dry mixture is coated evenly with the wet mixture. Divide the granola evenly onto the 2 cookie sheets and spread out into a flat layer. Bake for 30-35 minutes, until the mixture is golden brown. Make sure to stir halfway through. Allow the granola to cool for 20-30 minutes so it sets and crisps. Break the sheets of granola into clusters. Enjoy immediately or store in an airtight container for up to a month.